The FPUC200 has been discontinued. Please contact our Flow and Environmental department for possible substitutes. 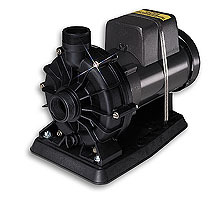 All major pump parts in the FPUC200 Series are precision molded of tough, corrosion-resistant glass-reinforced polyester or Noryl glass-reinforced thermoplastic. These high-strength plastics provide resistance to water and salt water as well as to many acids, bases and solvents. O-rings and seals are of EPDM, FKM, or Buna-N. They utilize 18-8 SS wetted internal hardware. For extra corrosive service, the motor shaft adaptor can be made of titanium, the impeller screw can be encapsulated in polypropylene, and the mechanical seals can be made metalless with FKM and siliconized graphite seal faces (add suffix “-TPV” to the model number and add $700 to price), or the mechanical seals can be made metalless with EPDM and siliconized graphite seal faces (add suffix “-TPM” and add $638 to price). *GPM @ 1725 & 3450 RPM, 60 cycle motors: LPM @ 1450 & 2850 RPM, 50 cycle motors. For Noryl body instead of polyester, add suffix “-NL” to model numbers, and add $45 to price. For optional Buna-N or FKM elastomers, add suffix “-B” or “-V” to model number and add $138 for FKM, no charge for Buna-N. For 50 Hz motor, please specify ”-Voltage/Phase/50 Hz” (consult OMEGA'S Flow Engineering Department for price). To order an EDPM fitted hard siliconized graphite faced shaft seal for abrasive applications, add suffix “-SC” to model number and add $215 to price.